Poll Results: What Job Search Obstacles Have You Overcome? Everyone’s career path is different and often filled with unexpected twists and turns. Whether it’s a lay off or voluntary career change, it’s important to evaluate the situation and come up with a game plan for your job search. In October, we asked our Movin’ On Up readers what job search obstacles they have overcome, and what we found was telling. Not having a network and concern about age took the top spots in our poll at 14% each. A total of 11% of respondents said they have fear/anxiety in a job search, while 10% have faced an outdated resume. After you have identified an obstacle or two that is keeping you from getting that next job, make an action plan with realistic and achievable goals. If you struggle with an outdated resume, sit down and work on one section at a time. If you don’t have a reliable form of transportation to get to job interviews, research local organizations to see if any offer assistance to job seekers. 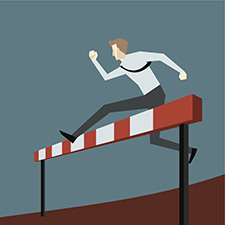 What are some other ways that you can overcome obstacles in your job search? Let us know in the comments below! Poll Results: How Many Years Have You Been with Your Current Company? Poll: How Many Years Have You Been with Your Current Company? Poll Results: Does Your Company Have a Workplace Chaplain? Question of the Month: Does Your Company Have a Workplace Chaplain? Open-Ended Survey: Tell Us What You Think of the Blog!